Well, as you have probably found out...flu season is upon us. Like I have mentioned before, we have realized that for about a month here at our house...thankfully we are on the up-swing now! If you are like me, you probably have been disinfecting and sanitizing to try to keep those ugly germs at bay. I have a great new product to share with all of you today that will knock your socks off!!! IV7 Ultimate Germ Defense is a disinfectant spray that works better than other sprays because it is DIFFERENT. How different? Well, MAJORLY different. The active ingredient in IV7 Ultimate Germ Defense is Silver Dihydrogen Citrate...which basically is Stabilized Ionic Silver. Have you ever heard of Colloidal Silver? I have...it's very powerful stuff. I use it topically as well as take it orally. When I feel a cold coming on, I put rub it on my face, neck and chest and typically, if I do it early enough, the cold will be gone within a day. Well, IV7 Ultimate Germ Defense works pretty much the same way only the silver is stabilized...which is great! 1. Kay- Best deodorant ever. 2. Kay and several friends- great for spraying mosquito bites. 3. John,Kay, Carol Ann- spray toothbrush in the morning before use. 4. Kay- one spray in dog(or cat) water bowl about 3 times per week for brighter teeth and cleaner gum's. Afterwards, just spray about once per week. 5. Krystine- sprayed psoriasis on arm for 5 weeks. It was gone. 7. Kay - sprayed her dogs rash on tummy. Rash was gone in 2 1/2 days. 9. Ruth- sprayed poison Ivy areas and eased the itching almost immediately. Poison Ivy was gone in 3 days. 10. Kay- sprayed a plant that had a fungus on it. Within 4 hours the leaves were turning green again. These testimonials really do not suprise me as I already am aware of the fabulous benefits of using silver for health purposes. What really excites me about this product is that it comes in a really nice spray bottle and even in small, compact spray bottles for easy transportation. There is no odor and it looks like water...but it is very powerful! WOW! I am so glad to have this product in my cabinent!!! There are very few products out on the market that can kill these germs all in one bottle. Most products that I have purchased for germ killing purposes smell nice...and that is about it! IV7 Ultimate Germ Defense continues to kill germs for up to 24 hours and is in the lowest toxicity category assigned by the U.S. EPA...therefore, there is no hazard warning on the label. It is a patented antimicrobial and kills germs as fast as 30 seconds!!! The odorless quality of IV7 makes it super easy to use in a crowded room and it wipes down easily. There is also NO SKIN IRRITATION and it is a non-flammable product. 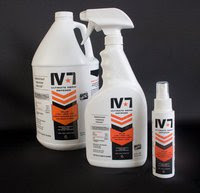 So, in my opinion...IV7 Ultimate Germ Defense is an amazing product. It is convenient and family friendly to use. You don't have to worry about the safety of your children when using it and can even use it on your skin! "TO ALL NON WINNERS- ANYONE WHO BUYS IV7 FROM THE WEBSITE AND AGREES THAT THEY WANT TO PROTECT THEIR LOVE ONES EVERY MONTH, I WILL TAKE $6 OFF THEIR ORDER EACH AND EVERY MONTH THEY STAY ON AUTO SHIP... EVERYONE WINS IN THE END." Mandatory Entry:Tell me what you would use this product on. You do not have to be a blogger to enter, but you must have a valid email where you can be reached should you win. If you do not leave an email address, it must be where I can easily find it. This giveaway is open to US residents and will end 12/27 at 11:59 pm EST. The winner will be chosen using random.org and will be notified by email. The winner will have 48 hours to respond, or another winner will be selected. Disclaimer: I received no monetary compensation for this post. I did receive free IV7 Ultimate Germ Defense Spray (4 bottles total) for review purposes. All quotes are from the IV7 Ultimate Germ Defense website and email. All thoughts and opinions are mine. This product is seriously a dream come true for me! I would use it everywhere possible-my kitchen, all the bathrooms, anything that can be cleaned! I'm familiar with colloidal silver, but not this product in particular. Sounds like a great product! I'd use it for about anything I could: colds, in my dog's water, on my toothbrush, rashes - just to name a few! I would use it when cleaning my house! I'd use this product on door handles, telephones, computer mouse, faucets and more. I would use this on our door knobs and seat belts (around the neck area). My husband got Staph several months ago from his boss's (who had staph, obviously) seatbelt after driving his car. I never want to deal with that again! Liked and told them you sent me! I would use this product on EVERY thing my 3 yr old son comes into contact with/ touches. He has Cystic Fibrosis so we have to be very careful when it comes to germs. I believe this product could really help us. Thanks for the chance! Following you on GFC as Silver Bella! I "like" IV7 Ultimate Germ Defense on Facebook as Silver Bella! I'd use this on doorknobs, counters, and my plants that are sick! I would use this product in the kitchen and definitely in the bathrooms! I "like" IV7 Ultimate Germ Defense on Facebook and wrote that you sent me! gone in a couple of days.